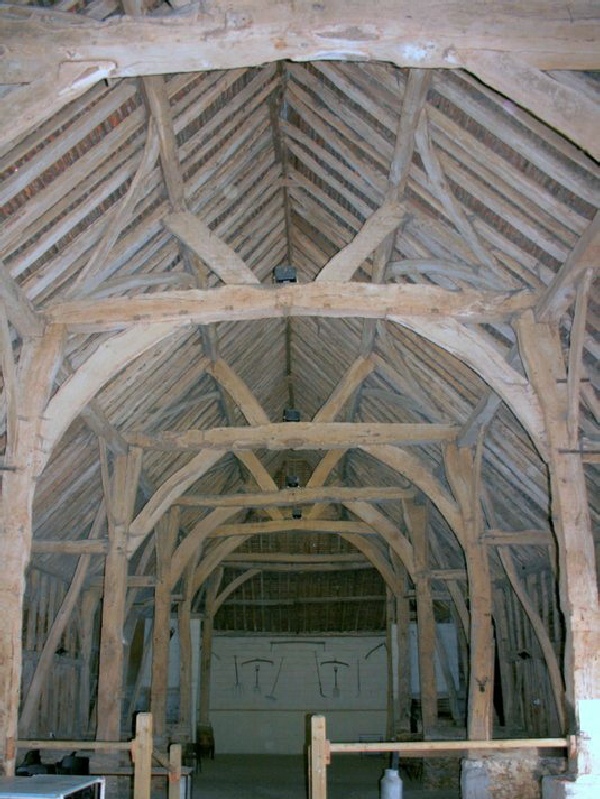 The barn at Manor Farm is a very fine example of its type. It is about 90 feet long and 29 feet wide, divided into 8 bays. It has two large entry doors on the side facing the farmyard. It was built in about 1495 to store all the crops from the manor farm. The arcade posts are about 16 feet tall and these have a thicker section or "jowl" at the top to accommodate the complex joint where the tie beam between the two aisle posts meets the longitudinal "arcade-plate" or purlin and the principal rafter. The barn is still in private ownership, but the owner was kind enough to allow me inside to take photograph. It is also used for community events.